When Did the Board of Commissioners Vote to Approve a Trademark Application? 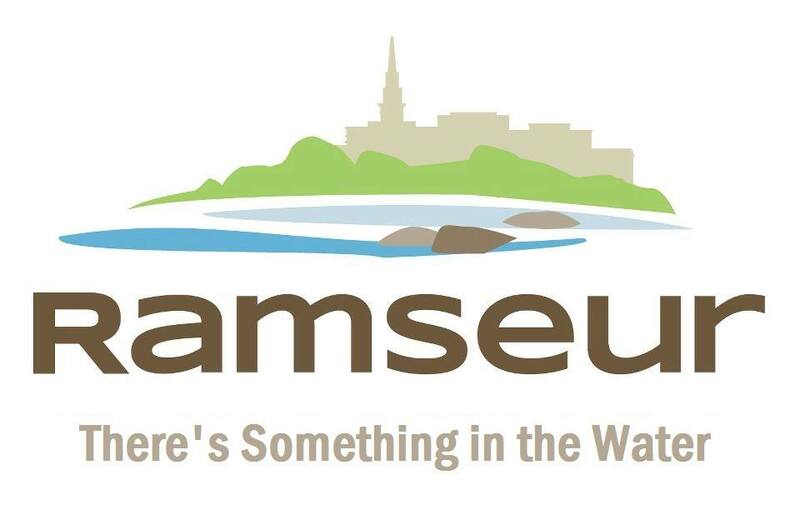 At last Monday’s regular meeting of the Ramseur Board of Commissioners, near the end of the agenda Commissioner “Adam” Smith informed those in attendance that he had trademarked the Town’s “logo”. Mr. Smith was very clear in his remarks. He did not say that he had applied to register a trademark, he said it was “done”. There are a number of things wrong with Smith’s statement and his actions leading up to that statement. Video of the discussion can be viewed below. 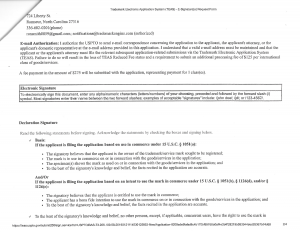 Trademark applications typically take several months or longer to reach their conclusion, yet Commissioner Smith implied to the Board that the entire process was complete. If Commissioner Smith has the power to push a months long bureaucratic process to completion in less than sixty days I’d be interested in knowing how it was accomplished; but it wasn’t. 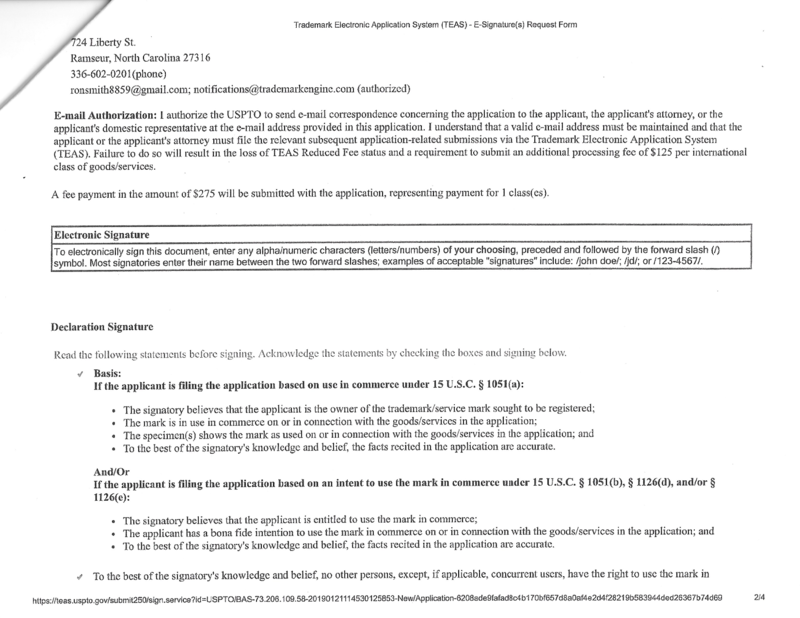 Public documents I’ve obtained indicate that Mr. Smith, acting on behalf of the Town of Ramseur, applied to register a trademark for the Town without knowledge or approval of the full Board of Commissioners; action that he was not authorized to initiate on his own. It might be argued that this was an administrative action, carried out at the direction of a town administrator with no need for Board approval. 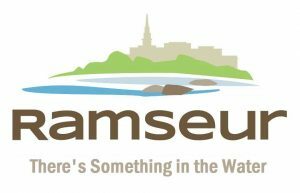 Since the Town of Ramseur has no town administrator, and neither the mayor nor any commissioner may act as such, the Board of Commissioners would have needed to vote in a public meeting for such action to be legal. That does not appear to be what happened. 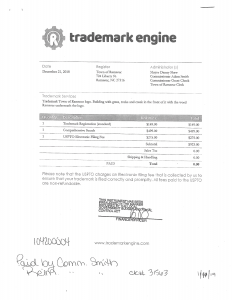 The first document linked above shows that Commissioner Smith submitted a trademark application through a website called Trademark Engine on December 21, 2018, at a cost of $923. The document lists Mayor Danny Shaw and Commissioners Grant Cheek and “Adam” Smith as administrators. Conspicuously absent from the document are the names of Commissioners Caudle, Cox, and Overman. 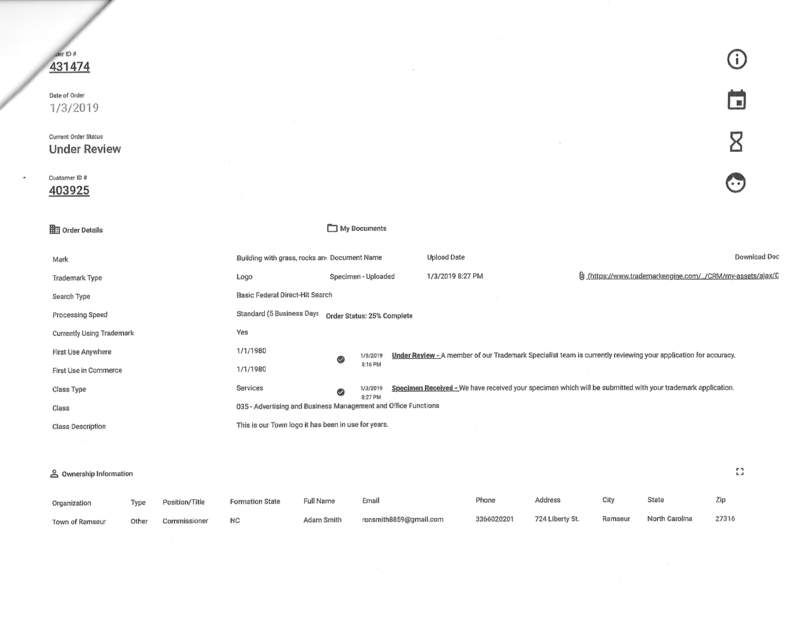 According to the Town Clerk’s note at the bottom of the page, this fee was paid by Smith and reimbursed to him on January 11, 2019. 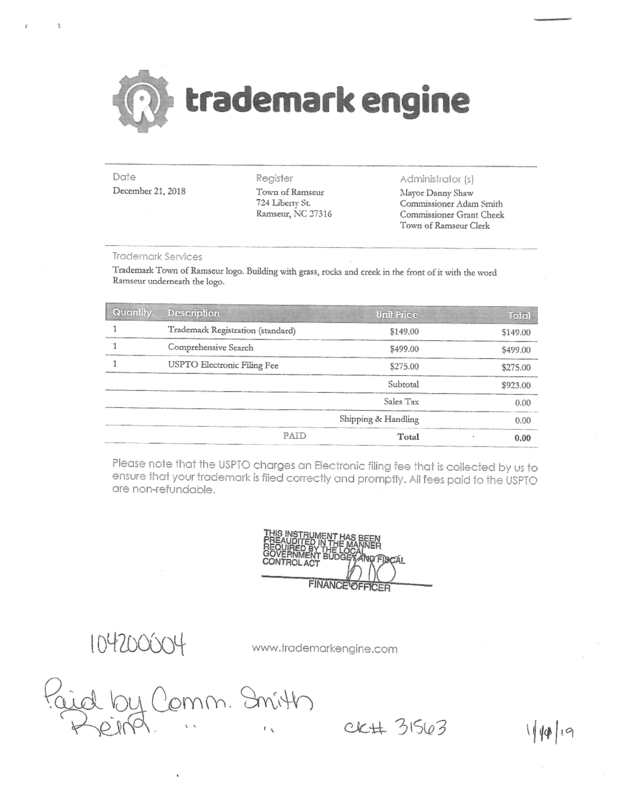 The second Trademark Engine document linked above contains several interesting dates. Examples of the logo to be trademarked were uploaded on January 3, 2019. Smith’s twice claims that the first use of this logo was January 1, 1980, but most Ramseur area residents know that this image was designed by local artist Kerri Cox Lindley in 2012. Many of us voted for it on in an informal Facebook poll. Smith’s claim that it was in use in 1980 is a false statement. 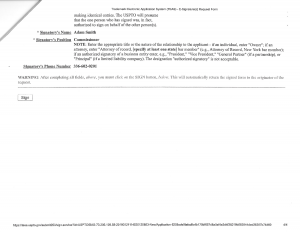 Digging further into the application documents we see that Smith listed his personal email address and telephone number on the Trademark Electronic Application System E-Signature Request Form, rather than using his official Town email or the telephone number of the Town’s administrative office. I see no way any reasonable person could believe this was done in an official, approved capacity on behalf of the entire Board of Commissioners. 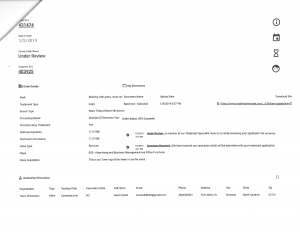 Smith acted on his own, though it seems plausible that Mayor Shaw and Commissioner Cheek knew about it long before the meeting held on February 4, 2019. 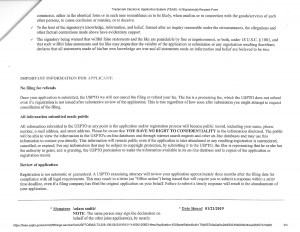 At that meeting Smith and several members of the Board insisted that the Board had voted to pursue trademark registration in the last few months, but I have reviewed the minutes from both the December, 2018, and the January, 2019 meetings and I find no mention of trademarks nor votes authorizing anyone to begin the trademark registration process. I have also reviewed the recordings of the ‘mayor and commissioner comments’ sections of the December and January meetings and again found no mention of the word trademark in either recording. Let’s review. In December of 2018, Commissioner Smith decided to trademark the “Where Family and Friends Meet” slogan and Kerri Lindley’s design. He paid a $923 application fee and was reimbursed for that expense by the Town of Ramseur on January 11, 2019. The application was completed on or about January 21, 2019, based on dates shown in the documents provided above, and none of this was done with the knowledge or approval of the full Board of Commissioners. What I want to know is why is Mr. Smith so concerned with trademark infringement? I’ve been told, by several independent witnesses. about a conversation that occured after the November, 2018, Board of Commissioners meeting. All witnesses I’ve spoken to have indicated that Mr. Smith was observed attempting to “intimidate” a local business owner, Tim Matthews, into taking down a website he operates at Ramseur.Org. At one time I believe Tim’s site did use the ‘Family and Friends’ image as part of its design, but as of this writing the image is no longer in use there. According to several witnesses to the same conversation, Commissioner Smith also wanted video recordings of Board meetings banned, which is unlawful under state and federal law. The only other reason I can find for Smith’s seeming obsession with the “logo” is a parody image I have used a few times on Facebook, in which the phrase, “There’s Something In The Water,” is substituted for “Where Family and Friends Meet”. Such usage is known as satire or parody, and is a protected form of free speech under the First Amendment. Let’s hope Mr. Smith and his peers on the Board do their homework on that subject before they waste any more of our tax money on frivolous legal gymnastics or tilting at Smith’s windmills.